The Timberland Euro Hiker, one of the most popular styles from the brand is now on sale at some very tempting prices. Timberland is coming up each year with new twists on this style, a modern hiker boot that many wear as a lifestyle shoe. The Timberland Euro Hiker features a waterproof material upper with a oversized padded tongue and collar. The Timberland logo appears on the tongue and heeltab. The midsole is prolonged on the upper side for a better protection in wet conditions. The EVA midsole gives is a modern look while the rugged outsole provides the traction Timberland boots are known for. 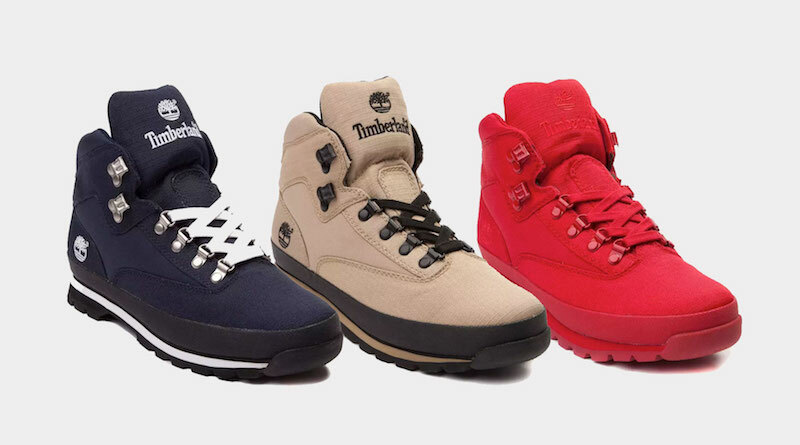 Currently there are several coloroways for the Timberland Euro Hiker at Journeys with ripstop or leather upper, most of them on sale for a limited time, with the lowest prices starting at $79.99.